Here are some notes throughout the 38-car field that raced in the Mobil 1 Twelve Hours of Sebring, and the event itself. Here’s Daytona’s notebook as well, for reference. 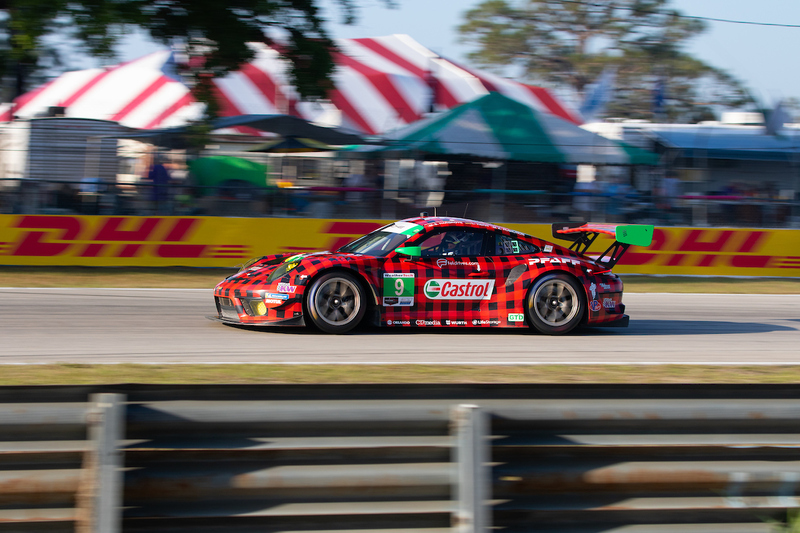 A Thursday IMSA news release confirmed that the SuperSebring weekend set an all-time Sebring International Raceway attendance record. Ticket sales and camping increased by more than 40 percent, year on year. U.S. television viewership of the race on CNBC and NBCSN grew 46 percent over 2018. 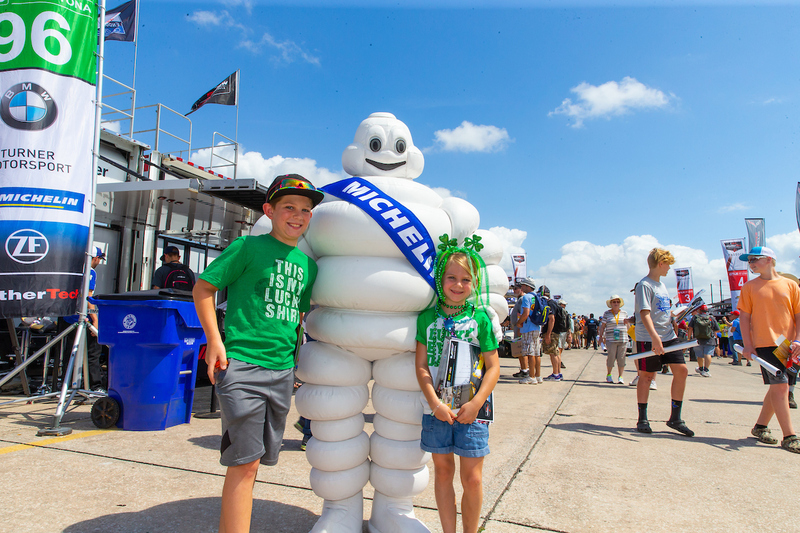 As noted in the post-race release, Michelin teams completed more than 30,000 laps and more than 127,000 miles over the week at Sebring International Raceway. This covered four series, three in IMSA plus the FIA World Endurance Championship. Pipo Derani’s third win in four years at Sebring matches the late Phil Hill’s record spread over 1958, 1959 and 1961 when driving a Ferrari. Derani, impressively, has won his three in three different cars with three different brands: a Ligier JS P2 Honda (2016), Nissan Onroak DPi (2018) and now Cadillac DPi-V.R. More on his record is linked here, via Sportscar365. For the No. 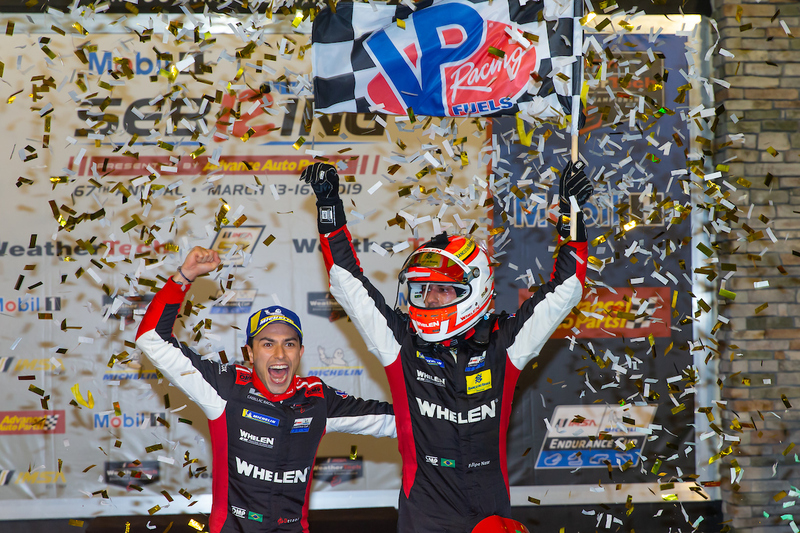 31 Whelen Engineering Racing Cadillac DPi-V.R of Derani, Felipe Nasr and Eric Curran, Saturday’s race win was a breakthrough after three near-misses at Sebring. The team finished second in 2016 and 2018, and third in 2017. Cadillac combined to lead 358 of 593 race laps at Daytona (No. 10 car 259 laps, No. 31 car 97 laps, No. 85 car 2 laps), or 60.37 percent. The percentage grew massively at Sebring, with the Nos. 31, 10, 5 and 85 Cadillacs combining to lead 344 of 358 laps, 96.09 percent. All told for the “36 Hours of Florida,” Cadillac led 702 of 951 laps, or 73.82 percent of total laps overall and in DPi. Cadillac’s podium sweep was its first in IMSA competition since COTA in May 2017, when the No. 10 Cadillac beat the Nos. 31 and 5 Cadillacs. Best of the non-Cadillac entries, Acura Team Penske’s No. 7 car finished fourth and the CORE autosport-run No. 54 Nissan finished fifth. Both of these cars have two top-five finishes in the first two races of the year. Mazda, which has a pole and a fastest race lap thus far in 2019, is yet to score its first top-five of the new season. A clean race with no mistakes allowed Performance Tech Motorsports to break through for the LMP2 class win. Kyle Masson added the 2019 win to a PC class win in 2017, while Cameron Cassels (who raced with three broken ribs) and Andrew Evans won in their race debut for the Brent O’Neill-led team. 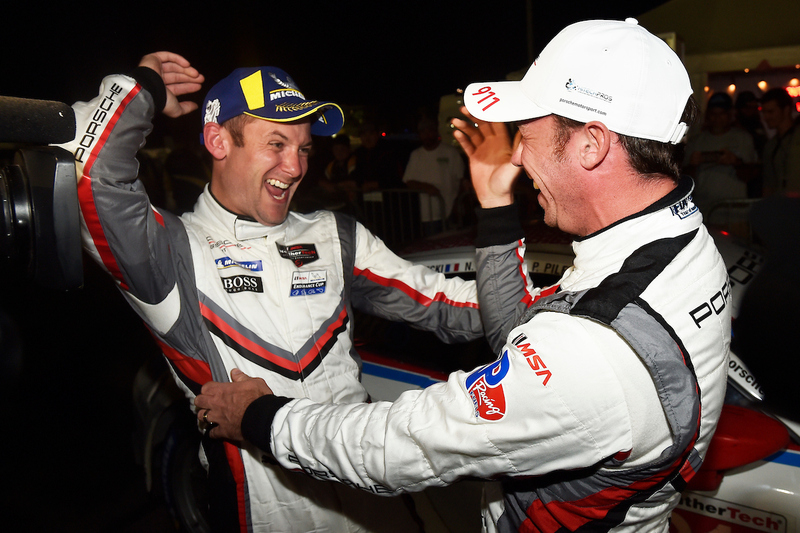 Patrick Pilet, Nick Tandy and Fred Makowiecki have, in the last 12 months, captured two Sebring 12-hour wins, a Nurburgring 24-hour win and a Motul Petit Le Mans win. Add in Laurens Vanthoor, Michael Christensen and Kevin Estre winning the 24 Hours of Le Mans and Porsche has had an incredible recent run in endurance races. Ford’s No. 67 crew endured its second late-race heartbreak in as many races, particularly after leading 270 of 330 laps. An ill-timed pit stop cost a potential Rolex 24 win. Then in Sebring, Ryan Briscoe caught a kerb when trying to get past Andy Lally’s GTD class contending Lamborghini. This dropped the Briscoe/Richard Westbrook/Scott Dixon car to an unrepresentative sixth. Briscoe explained the vantage point from his viewpoint in a post-race video. The No. 67 Ford’s demise opened podium spots up for the No. 66 Ford and the No. 3 Corvette. Sebastien Bourdais, third driver to Joey Hand and Dirk Mueller, set a record fastest race lap in GTLM at 1:57.478. Corvette’s weekend is broken down in full here. Of note here is that the final caution inside the last 15 minutes potentially cost the No. 3 crew a victory, because the No. 911 Porsche and No. 66 Ford ahead of them were both tighter on fuel having last pitted more than an hour before the checkered flag. After a win in Daytona, BMW Team RLL ended fourth and seventh in Sebring. The No. 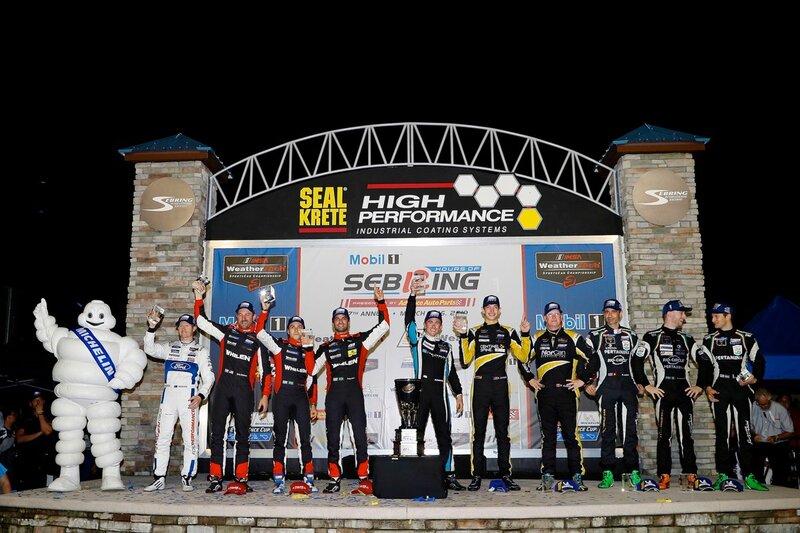 24 car in fourth ensured all four GTLM manufacturers were represented in the top four positions. All four GTLM manufacturers led at least one lap, as well. Lamborghini has completed back-to-back “36 Hours of Florida” sweeps, and with two different cars. Last year, the GRT Grasser team won Daytona with Paul Miller Racing winning Sebring in the first generation Lamborghini Huracan GT3. This year, Grasser has now won both the new Evo version, with Saturday’s win coming in a 1-2 finish over new Lamborghini team Magnus Racing. Scuderia Corsa scored its fifth straight Sebring podium finish with third place. Jeff Westphal joined Cooper MacNeil and Toni Vilander in the No. 63 WeatherTech Ferrari 488 GT3 and had a great weekend himself. He was the only driver to score podiums in both the 12-hour race and Friday’s IMSA MICHELIN Pilot Challenge race, which he won. Land Motorsport Audi ended fourth courtesy of a major fuel save run by Chris Mies, who shared the car with Daniel Morad and Ricardo Feller. Interestingly, both the Scuderia Corsa Ferrari and Land Audi were sent to the rear of the Daytona results for drive-time violations, but rebounded to finish third and fourth in class at Sebring. Riley’s No. 33 Mercedes led 41 laps and finished fifth here, with the trio of Ben Keating, Jeroen Bleekemolen and Felipe Fraga. During the week, the team also announced the same trio will partner with Wynn’s for its Ford GT GTE-Am class entry in this year’s 24 Hours of Le Mans. Both Meyer Shank Racing Acuras led (No. 86 led 62 laps, No. 57 led 14 laps) but fell to seventh and eighth. A triple stint by Katherine Legge in the Heinricher Racing, Caterpillar-backed No. 57 Acura NSX GT3 Evo briefly netted her the lead in the final couple hours before they fell back after the final caution. Neither Park Place Motorsports nor AIM Vasser Sullivan had the easiest race with its cars, but sixth and ninth (No. 12 Lexus) at least ensured both cars scored their second top-10 in as many races to start 2019. 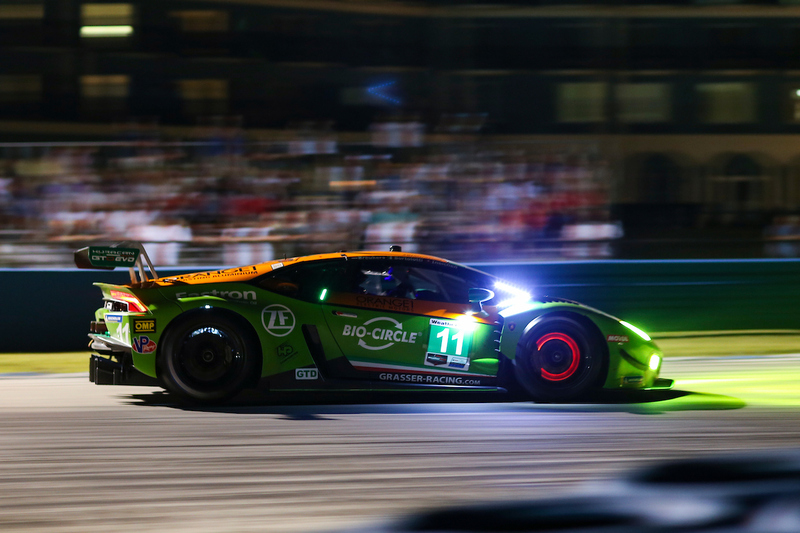 After 16 of 23 cars in GTD led a lap at Daytona, just seven of 17 cars led a lap at Sebring. These seven here included two Lamborghinis, two Acuras, and a single Porsche, Mercedes and Ferrari. With the Nos. 31 and 10 cars exchanging first and second place finishes in the first two races thus far, they’re tied atop both the WeatherTech Championship and Michelin Endurance Cup standings in DPi (67 points overall; 28 points for Endurance Cup). BMW’s Philipp Eng leads the GTLM standings on account of sharing the winning No. 25 car in Daytona and being in the fourth-placed No. 24 car at Sebring, but the Austrian only races Michelin Endurance Cup rounds. Behind Eng (63 points), just eight points cover the next six pairs of drivers (61-53). The No. 11 GRT Grasser trio leads the GTD standings by 16 points (70-54). However, realistically, the No. 12 Lexus pair of Frankie Montecalvo and Townsend Bell are the class leaders because the GRT Lamborghini will only race the endurance rounds. The Montecalvo/Bell Lexus pair is one of five pairings within just five points (54-49) before the next round in Mid-Ohio in May. Performance Tech’s pair of Masson and Cassels is seven points clear of PR1/Mathiasen’s pair of Matt McMurry and Gabriel Aubry in LMP2. Michelin Endurance Cup winning cars at Sebring were the No. 31 Cadillac, No. 38 Performance Tech Oreca, No. 67 Ford and No. 11 GRT Grasser Lamborghini. The two prototype teams also lead the season standings through two races, with the No. 911 Porsche and No. 33 Riley Mercedes atop the drivers’ standings in GTLM and GTD. Manufacturer-wise, Ford and Porsche are tied through two races in GTLM and Mercedes leads GTD.